Posted February 2019. This home has been archived on OHD. 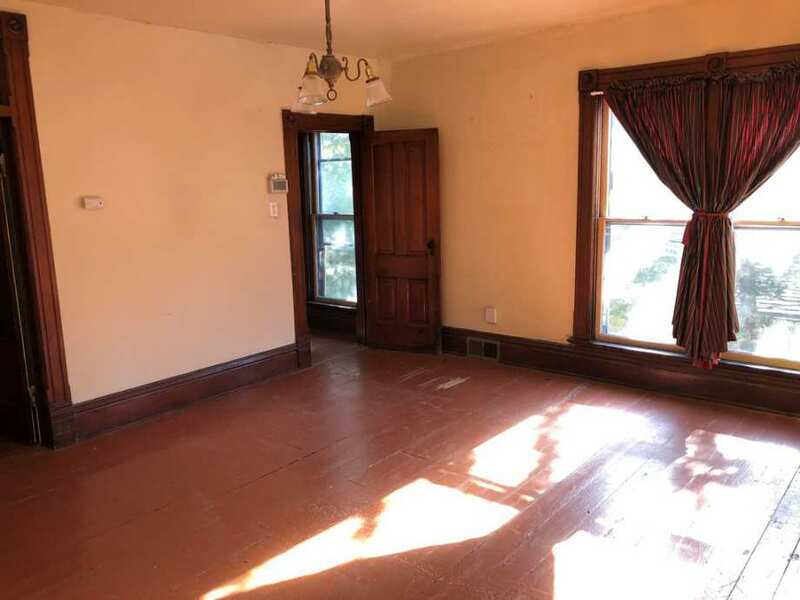 The sold status is unknown. 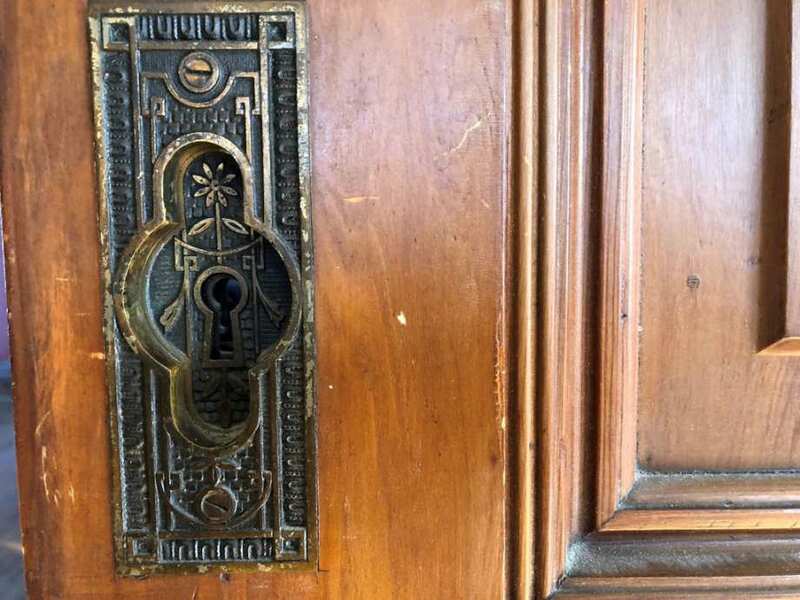 Unique details throughout this historic Victorian home. At a price you can now invest in the improvements! 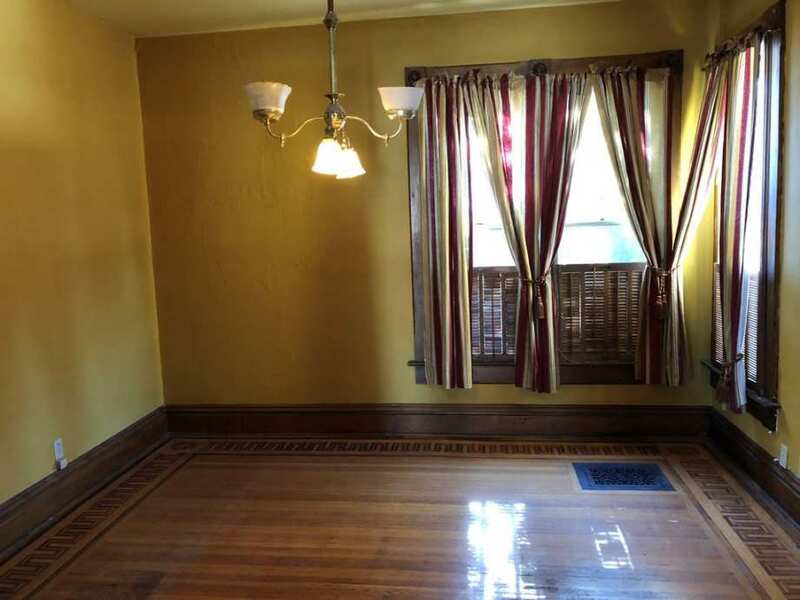 Inlaid hardwood floors, stained glass, pocket doors, built in cabinets, ceramic fireplace, and 10 foot ceilings! Walk up attic for additional expansion. Newer furnaces and A/C. 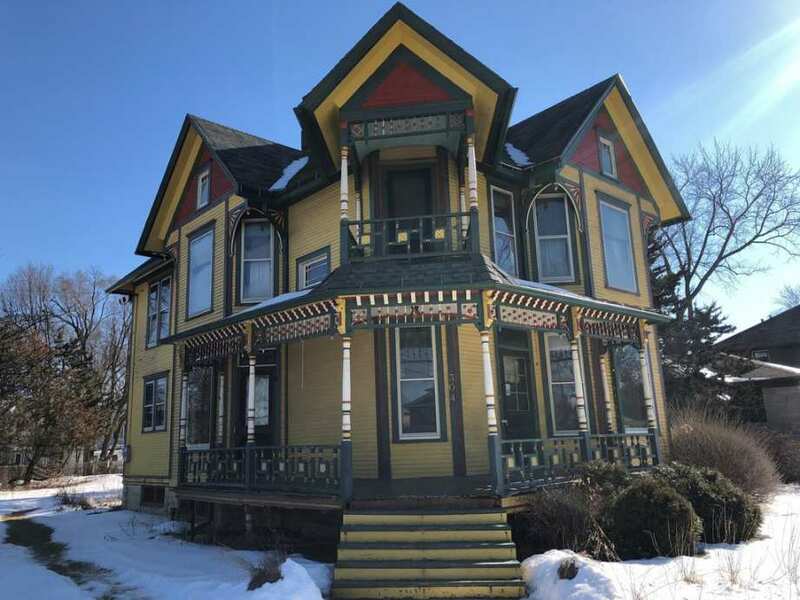 Zoning allows for home/occupation usage allowing for business and residence. Freddie Mac Owner Occupied First Look Program through March 1st, 2019. Easy to Show. 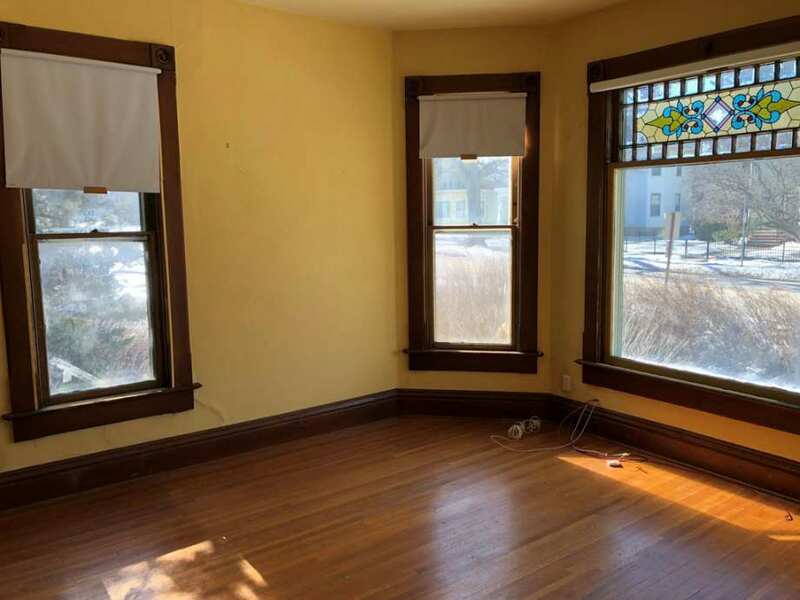 Very nice wood trim, inlaid floors, a couple of nice stained glass windows, etc. 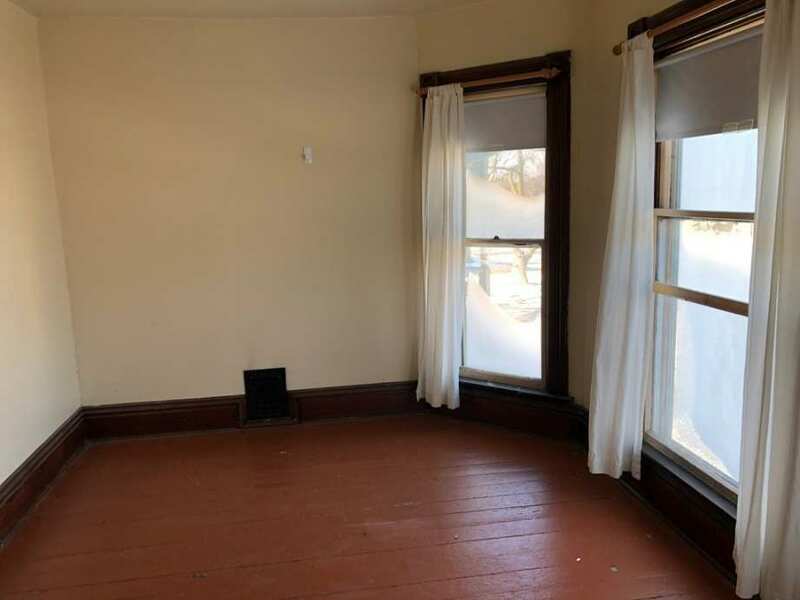 I think this could be a very nice home with the removal of all of the office furnishings. A couple of nice original light fixtures as well. I like! I had to go back and look at the photos after your comment. Nowhere in the photos I have access to are there office furninshings. I love this house. How wonderful are those sinks? Am I the only one who is entranced by sinks? the one in the kitchen reminds me of our when I grew up in Chicago. I like sinks and tubs, ice boxes, and pie coolers. This house ticks all the boxes. The inlaid floors are just spectacular. A definite plus having air conditioning. 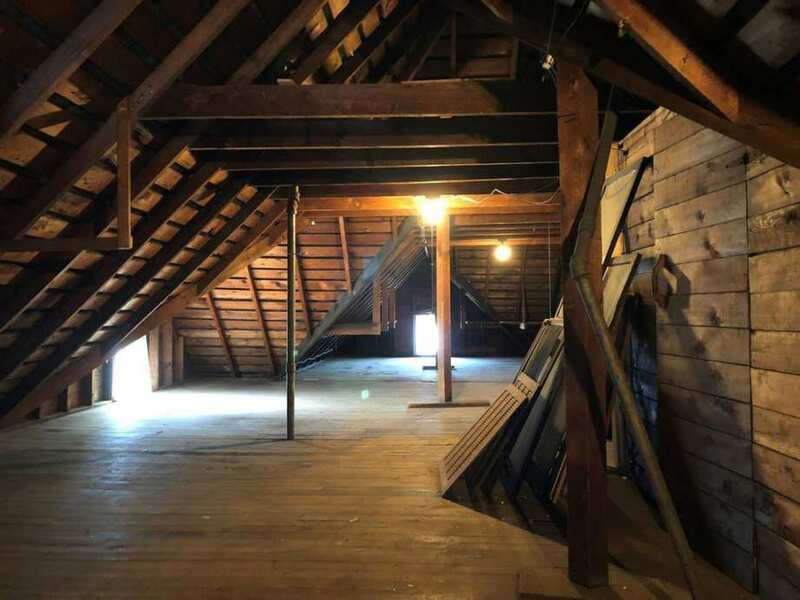 Who wouldn’t love an extra bedroom in that gorgeous attic? Beautiful. Would happily live there. They have done an outstanding job with the colors,the woodwork looks like new, it is perfect!! Beautiful house, like the stenciling, must have a ton of time to do that much intricate work. Like the kitchen sink and the corner marble sink. Originally posted 2018, not sold yet but back on the market with new photos and new agent. Updated info and photos, moved to front page, comments above may be older. 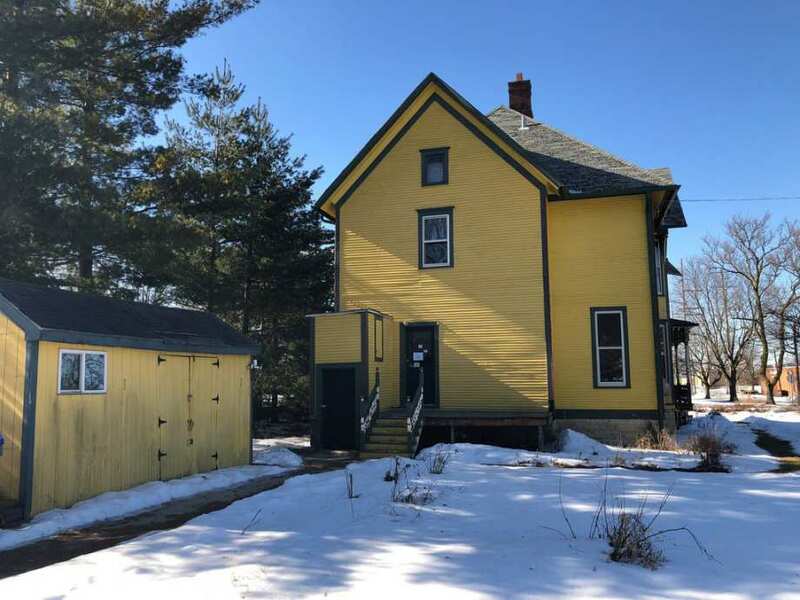 Kelly, I see from the older comments that this house was on the OHD site on 4-11-18. I have deleted my posts from that time period. 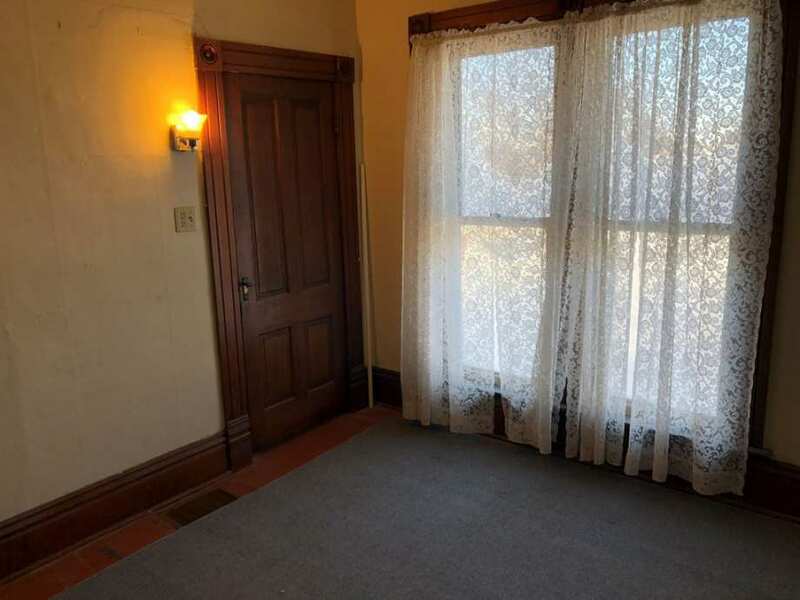 I thought the original listing had better pictures, if I’m remembering correctly. 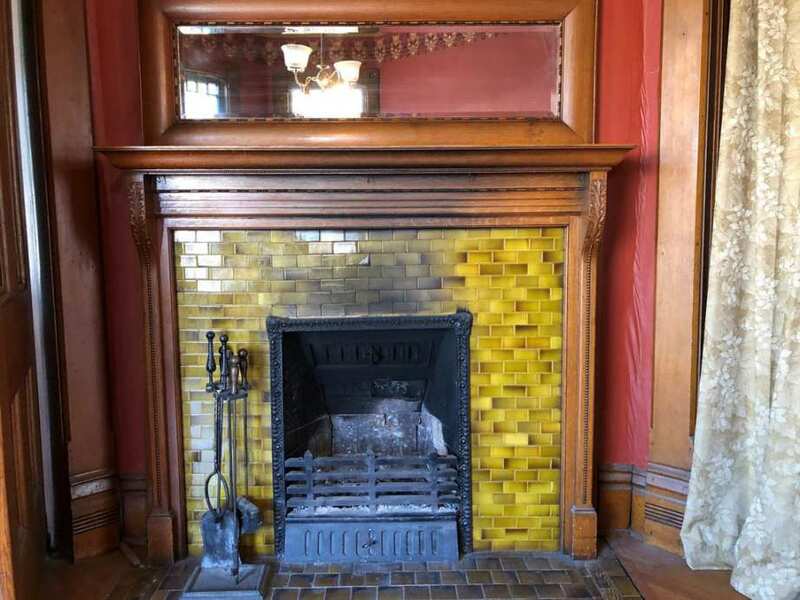 Is it possible for you to put the pictures from the original 2018 listing on? Thanks so much. 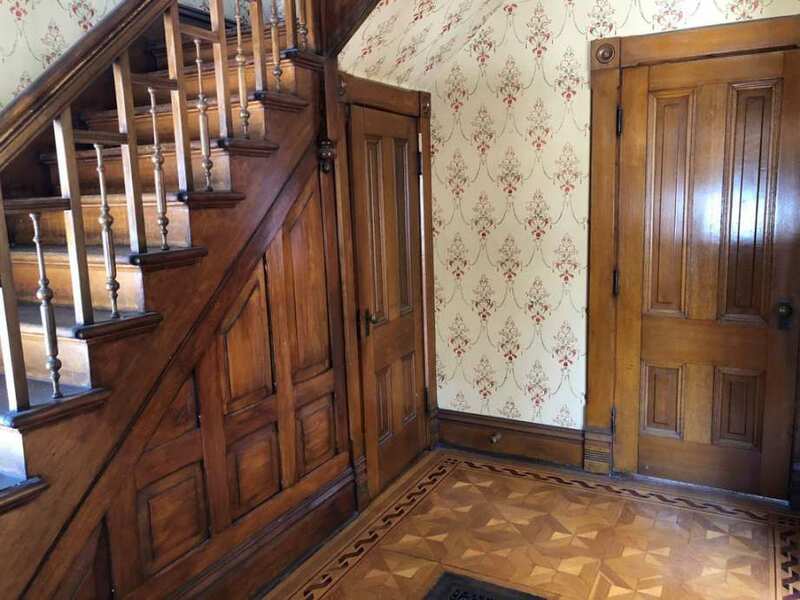 Sorry, I don’t have the old listing photos anymore. OK, and I failed to mention in my inquiry. Thanks for all you do, I really enjoy the OHD site and look forward to it every evening. I really like this house. It could shine up like a new penny. 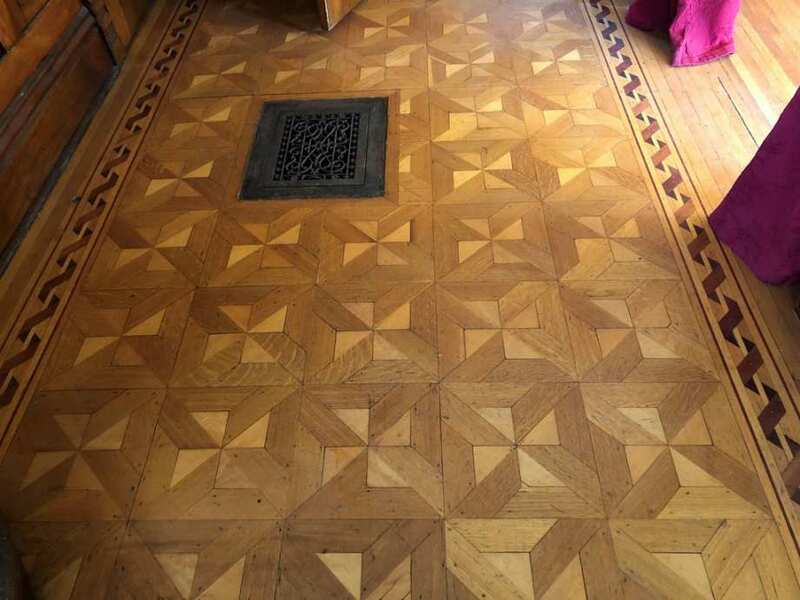 The inlay floors look like the ones you could order ready made from the catalogs in the 1880s and 1890s. 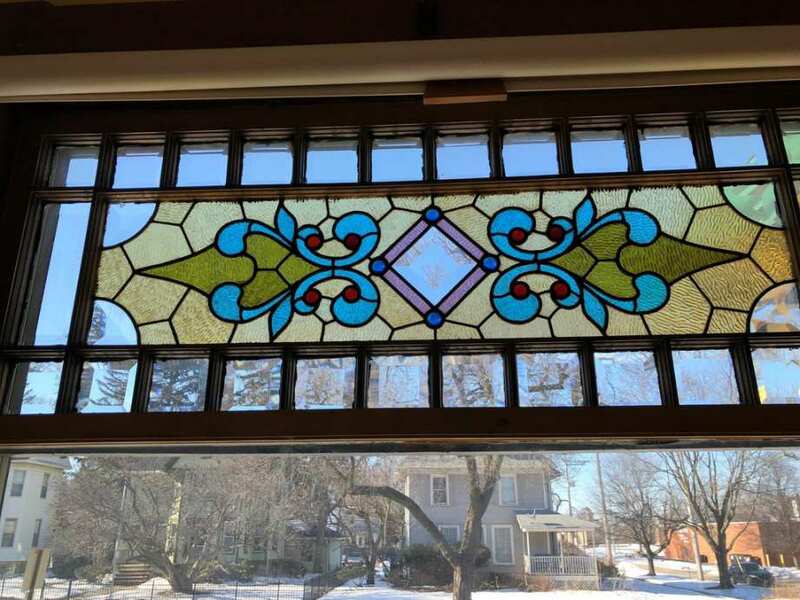 I love the art-glass windows and the beveled glass in the mullions. 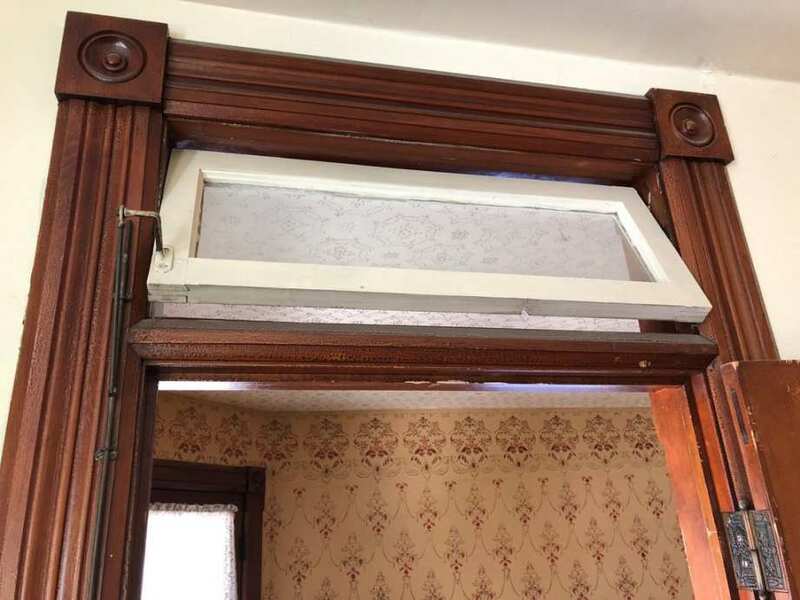 The built ins are spectacular and with a little clean up and adjustments, can look great again. Wow! 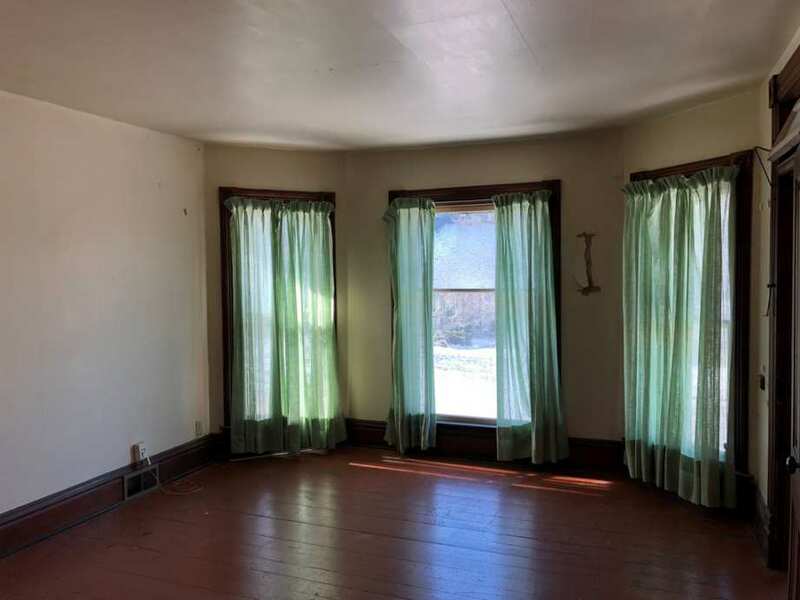 This house has so many sweet features! Assuming this house dates from 1890, native DeKalb architect George F. Barber had just relocated to Knoxville, TN a couple of years earlier. 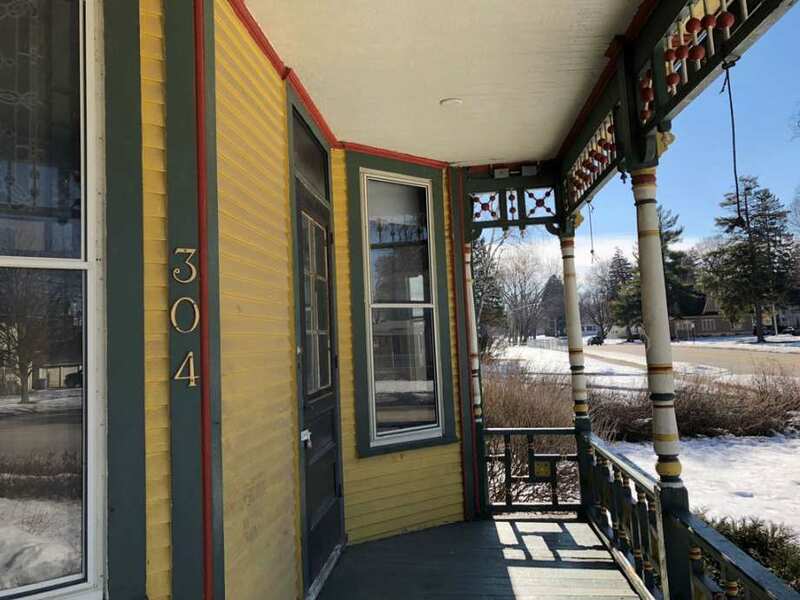 I’m wondering if there’s any design connection between this house and Barber? 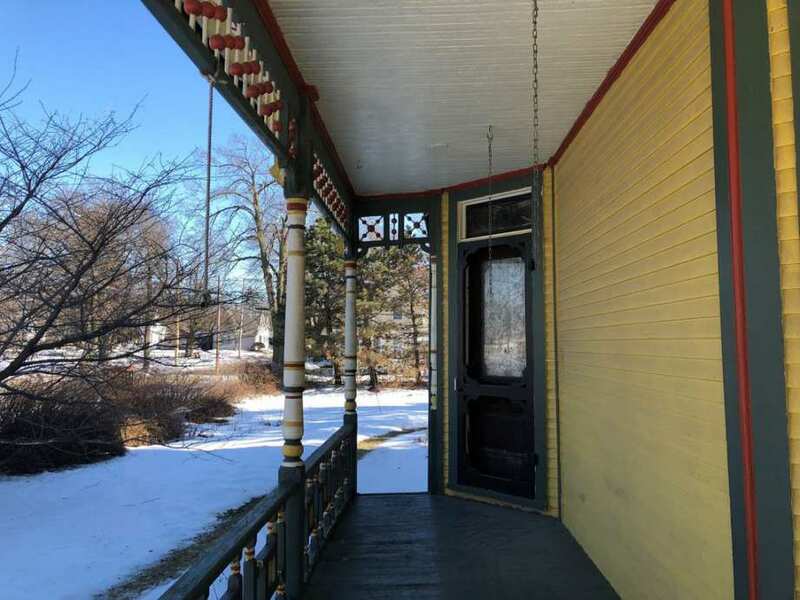 The interior is well appointed for a house of this period and the exterior has a lavish paint job that could be close to the original colors. 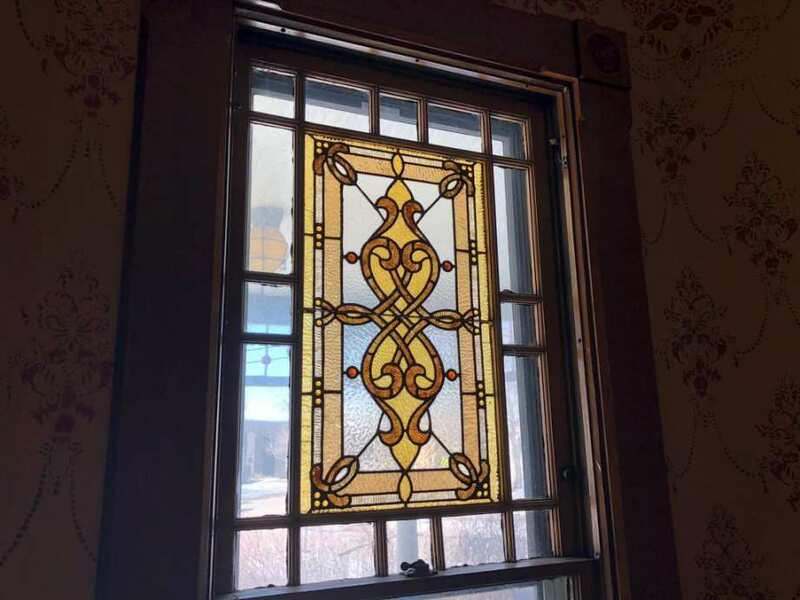 The stained glass windows were probably catalog ordered as were interior millwork details. 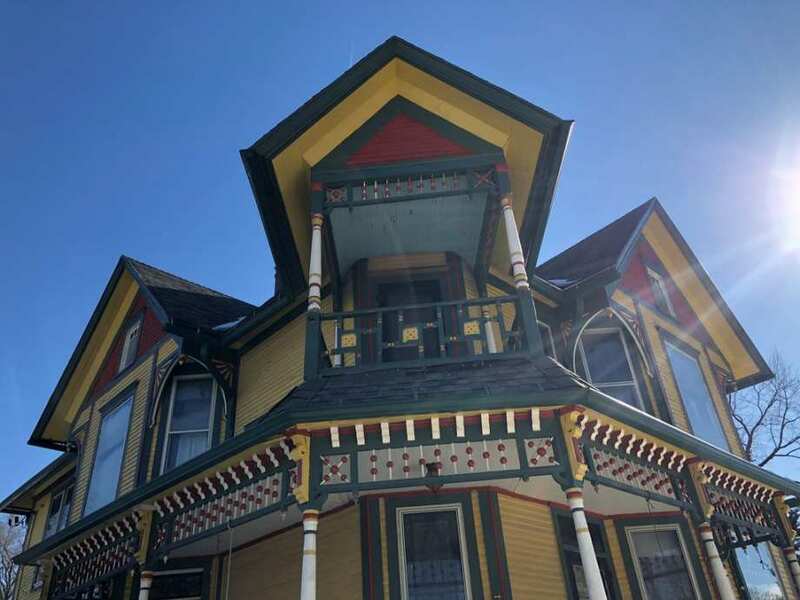 Nice house here for those who like ornate Victorian homes. Anything that needs done is just cosmetic…I would change indoor colors…and bye bye to curtains and light fixtures….more period light fixtures…question on kitchen sink…isn’t it low…I am 5’5″ and it looks so low to me…but I adore all those sinks…….what a beautiful home. Now that you say it, that sink is low. Its definitely not a comfortable height. 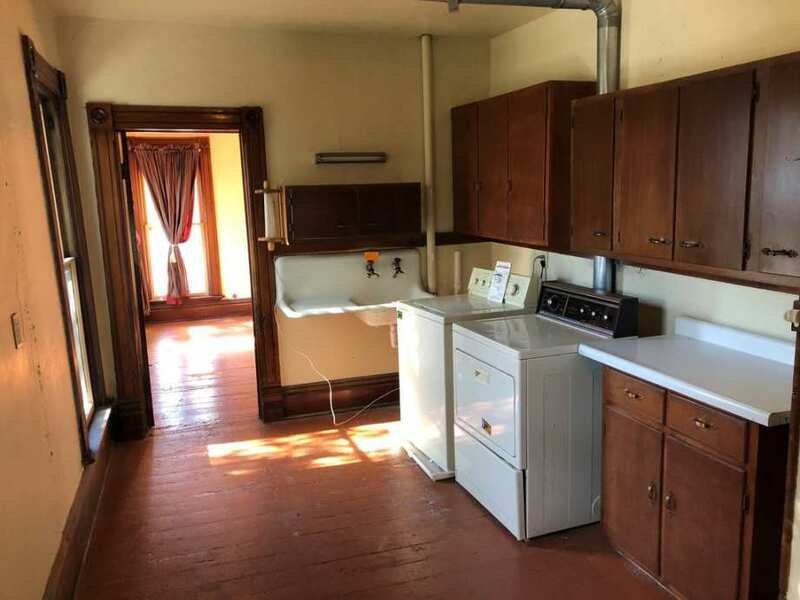 I wonder if whoever installed that sink, retro fitted it because they didn’t want it to go over the window sill or glass like some do? 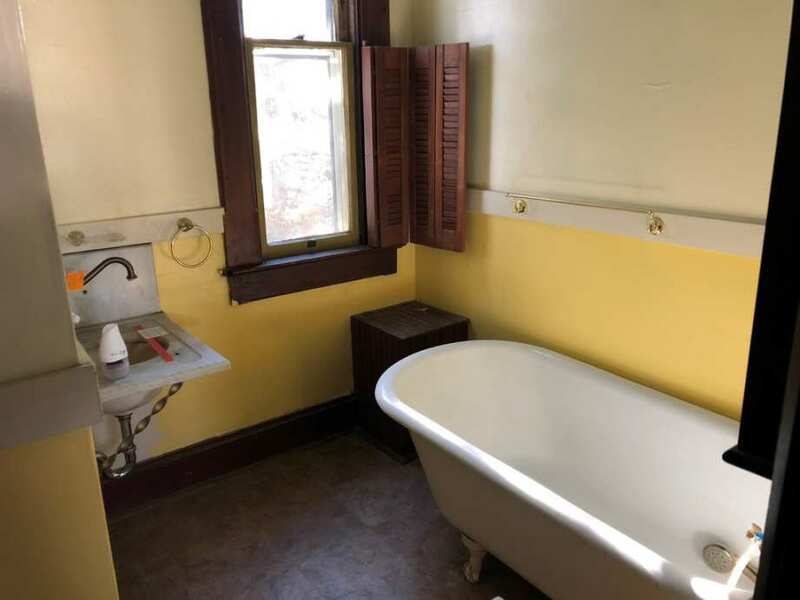 Doesn’t look like an 1890s sink does it? Most of my catalogs for sinks from the 1880s – 1900s are more ornate. P.S. I hope this doesn’t spark the age old debunk theory that it’s lower because people were shorter back then. Yes the average height was shorter in the 19th century but its not to be assumed that’s the reason why some objects are lower. Most objects were mass produced with inconsistent standards. Most experienced curators today will tell you that height has no relationship to average furniture, railings and beds like people love to say. There’s even a book on it now. Remember mass production on this scale was a new thing. The fact is, most sinks of the period that I have come across are the same height as now. Same inconsistency goes for furniture. 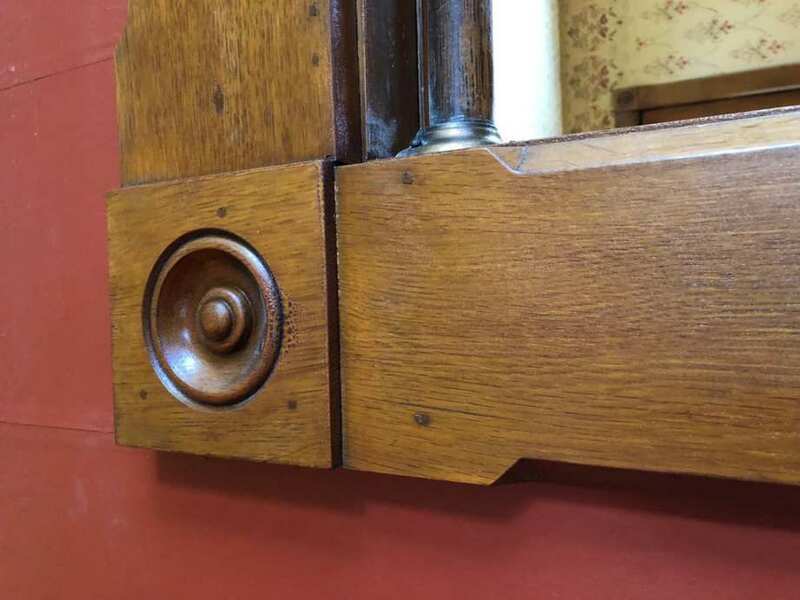 I buy and sell 19th century furniture and have measured them as well to help debunk this theory. Many formal parlor sets are lower to the ground by 3 or 4 inches while most dining room chairs from the late period are same height as today as well as Gothic Hall chairs and overstuffed couches. Several contemporaries of the period refer to their sets as “low”. Beds finally had standard sizes as well. Single and Double. (our twin and full)(inches were adjustable based on where you bought it). There were no queen sizes or kings yet. Gives people of today the allusion of a smaller bed with those big headboards. But its not a small bed because Victorians sleep sitting up. I have yet to read in any book of the period anything like this unless someone was sick with TB or had a cough where it recommends sitting up. Most Eastlake and Renaissance Revival beds can easily house our full size mattress. Railing heights are sometimes made lower on second floors to give the allusion to height (to the danger of the people). But not because of shortness. Sometimes short people from the time had furniture made special for them because their height was lower. 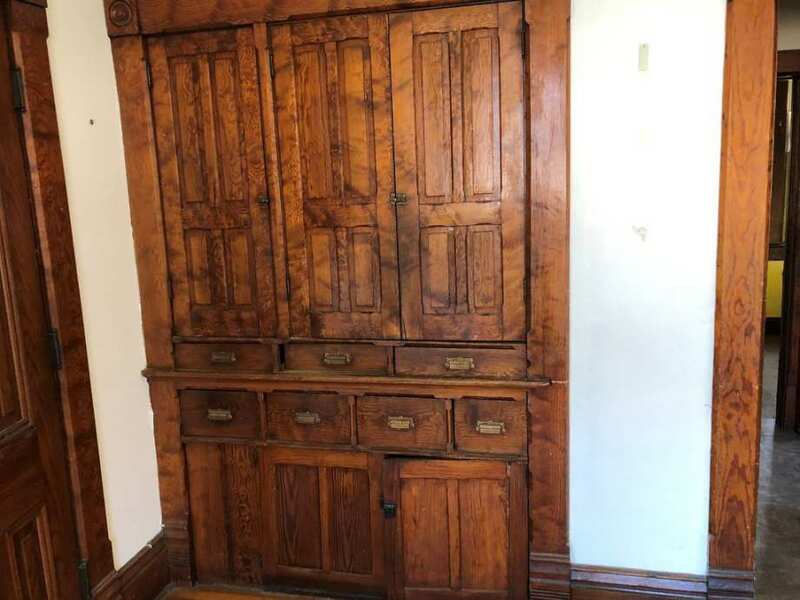 Like the writing desk at the Olana mansion for his short wife. Sorry. I’m on a rant today. Snow is coming. I hate snow. Worth it for the sinks alone- glorious house. I would say the kitchen sink is original. I think it was the 1912 Sears catalog that had an illustration of the housewife sitting on a kitchen chair while peeling potatoes into the sink. You know the height is original because of the peg-legs. The outside details — the balustrade and spandrels — are D. S. Hopkins, but I’ve never seen this diagonal-entrance plan in his books. I’m not sure. I’ve not seen this sink design in any of my 1890s to 1905 catalogs. I was looking again tonight to try and date the sink. It’s old but I don’t think original to the the first ten years. But I could be wrong. 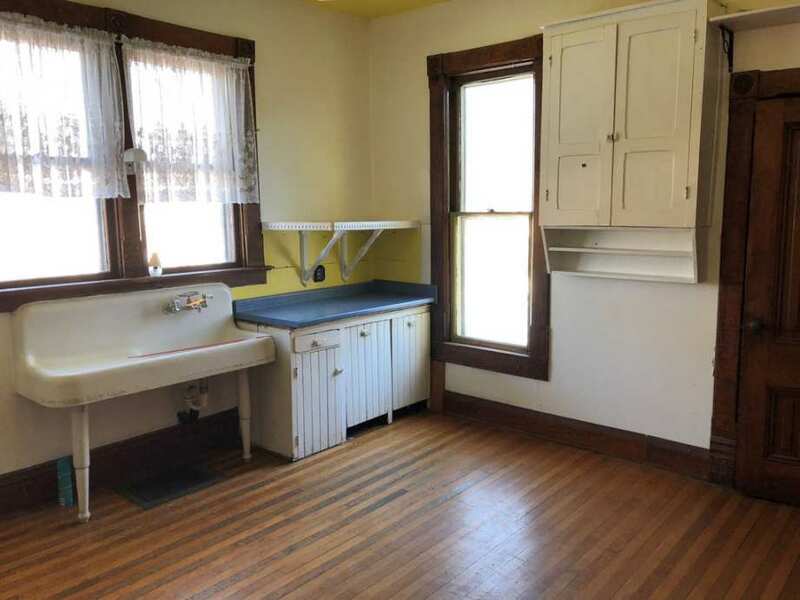 If the house is circa-1890, the kitchen sink cannot be original. 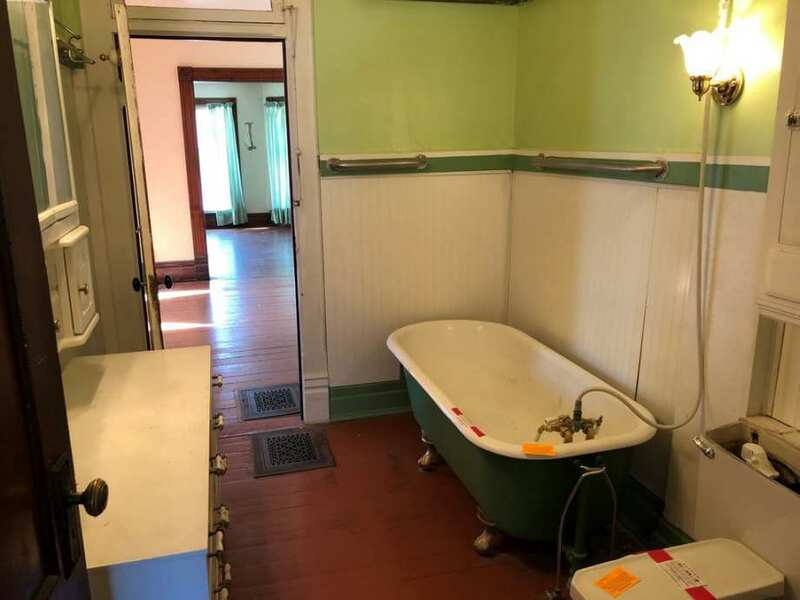 As noted, this style sink was introduced around 1915. May I please borrow $99,000? I would live here forever. Too bad there’s no picture of the stairway!! There is, unless you mean the newel post? Love it! Can’t believe the price! 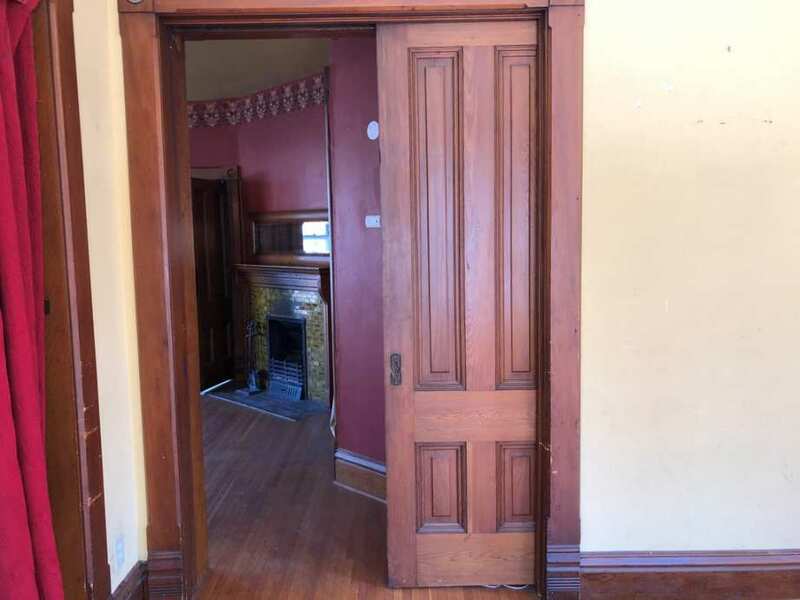 I love this house too, so many original details for the price. But the property taxes are $5121.00, that adds another $425.00 to the monthly mortgage. So disappointing. yes that’s what I mean. I’m using voice type sometimes and hit send. Glad you knew what i meant. That’s what happens with multitasking sometimes. Also happens with the your and you’re sometimes too. Unfortunately it was too late to fix and I can’t edit a few minutes. At least it wasn’t a curse.